Thanks for the nice comments on the handspun scarf! If you do end up knitting one yourself, do send me a photo or link, I'd love to see your version. I have not been much of a blogger lately. I have plenty of stuff to talk about: dyeing, spinning, new fiber acquisitions. I've even been taking photos at lunch when the sun deigns to shine. However, the blogging just hasn't been happening. The main culprit: Scott's first semester of college classes is coming to an end, and we've been ramping up to tackle research papers and exams. The last 2 weeks have been exhausting for him, tiring for me. I don't like MLA so much. Let's just say, we'll both be glad when classes end tomorrow! I've been sick, too. Caught a cold last week. I coulda used some cold medicine. Just sayin'. Still have a nagging tickle in my throat, but otherwise back to normal. The Project is complete, sent, and in the hands of the recipient, so I can actually talk details! This was tough to keep quiet, as evidenced by my vague and nonsensical posts. The FO is just so cute and perty, it's hard not to want to share. Notes: This was knitted at a smaller gauge than I'm used to, and the lower dress portion felt like it went on a while; once I got to the decreases and patterning section, it went much more quickly. Erin mentioned that only a friend would knit bobbles, and she's right. I'll admit, when I first settled on the pattern I did consider omitting them. I'm just not a bobble fan! But they're few and really do add to the charm. The front design is repeated on the back, no shortcuts there. 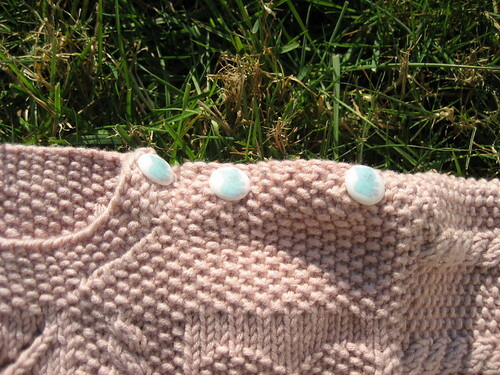 The sleeves are simpler, but still very patterned. The seed stitch / cable combo makes for a denser knit; they softened somewhat in the wash, but they did feel sturdier to me than the body. I hope it looks fine on the baby. Scott picked out the buttons. Despite being colorblind, he's my go-to guy for advice/opinions on color and buttons. I've mentioned before that it's a fussier knit than I'm used to. 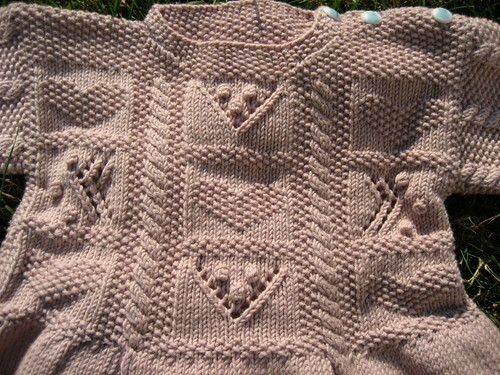 In fact, I would say (with a blush) that I wouldn't knit something so complicated for my own child! I don't knit such patterned things for myself, either. I guess I'm a lazy knitter, through and through (albeit with high standards). 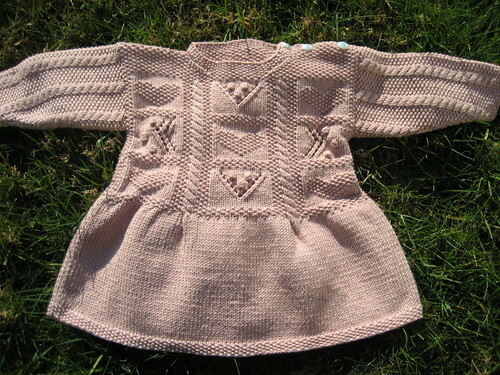 This one was definitely worth the effort, though, and I kept thinking about Erin's baby girl wearing it as I knit. The only thing I would change in the future (not that I'll knit this particular dress again) is how I did the neck decreases. Hindsight being 20/20, I figured out a better way to do it after the front was already done. Ah well. Next time.